Tibesigwa, Byela, Martine Visser, Mark Collinson and Wayne Twine. 2015. 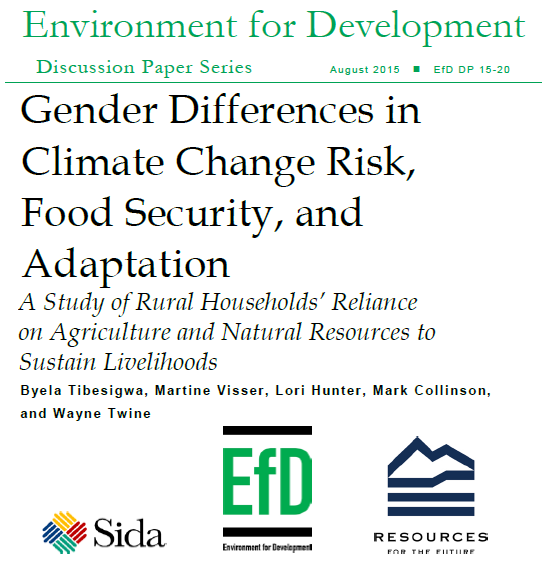 “Gender Differences in Climate Change Risk, Food Security, and Adaptation: A Study of Rural Households’ Reliance on Agriculture and Natural Resources to Sustain Livelihoods.” EfD Discussion Paper Series 15-20. Climate and weather variability in sub-Saharan Africa disproportionately leave female-headed households food insecure. However, the extent and reasons for these gender differences are, thus far, not well understood. This study examines gender-food-climate connections using longitudinal data from rural households in north-eastern South Africa. Results confirm gender distinctions in that male-headed households are more food secure. Importantly, however, female-headed households are not a homogenous group. Participation in agriculture and utilisation of natural resources narrows the male-female consumption gap to 10.3% amongst de jure female-headed households – those with female heads who are single, widowed, divorced, or separated. Yet, these land-based practices are associated with a greater male-female gap (27.4%) amongst de facto female-headed households – married female heads who are married, but whose husbands are away. Further, and contrary to expectation, weather-related crop failure threatens food security in both male- and female-headed households, but less so amongst de facto female-headed households, who remain more dependent on remittances.